I have heard the saying "When you are a parent, you wear your heart on your sleeve." That saying hit home the night Bunny was born. 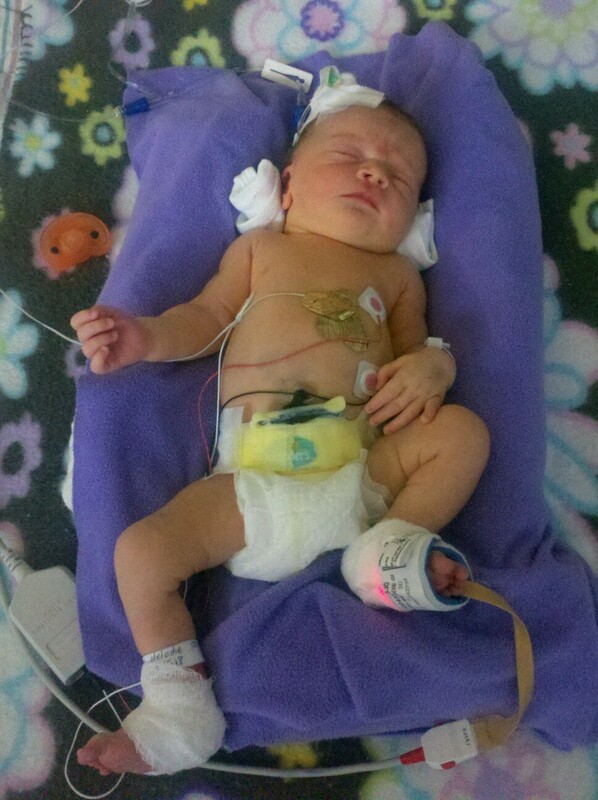 She had an infection, breathing trouble, and low body temperature so she was rushed to the NICU. Yet again, this was a particular plan I had NOT wanted to happen! I had wanted to avoid the NICU but alas there we were, 11:00 p.m. on Bunny's birth day, being escorted to the NICU. The first night, I was so tired from lack of sleep, drug hangover, and giving birth that it did not really sink in what exactly was happening. The next day was a different story. I have never felt so helpless in my life than when I had to stand there, looking at my wired and tubed child crying and I could not hold her or soothe her. Three months later, as I am writing this I still get this sick feeling in the bottom of my stomach at that memory. That is how long they kept her in the NICU. Only two of them were we allowed to really hold her because she eventually had to have a PICC line put into her head. It was the most freeing feeling when we were allowed to pack her up in her carseat and take her home! We were one of the lucky ones though, there were babies that had been there for a long time and still had a while to go before they could go home. I definitely pray differently now for mother's with sick children. That is an emotional place I hope to never have to visit again.